I’m so excited to announce the launch of the Fail Faster Playtesting Journal Kickstarter campaign. I’ve been working on this project for a year now and am excited to see what happens once it hits. You can get one final reminder by signing up to the newsletter at www.failfaster.ca (and you’ll get a free 16 page guide to Sales Sheets for board games as well). See you at 10am EST on Tuesday, March 5th (up until 6pm EST on March 28th). Interested in reading a 16 page guide that’s all about Sales Sheets for board game designers? In it I share the history of how they came to be, why I continue to use them and how to make your own. I include 5 actual Sales Sheets for games that ended up getting published, maybe because of the Sales Sheets?!! To get a copy, head on over to www.failfaster.ca and sign up for their newsletter. Fail Faster is a new venture that I am doing as a solo adventure! It’s a playtesting journal that will guide designers to take the notes they need to take in order to become better playtesters and ultimately, better designers. 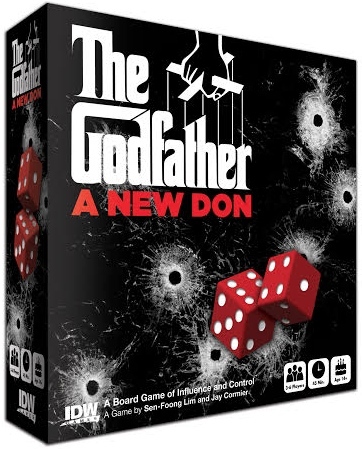 It will be on Kickstarter from March 5th to March 28th. Last year I chose not to attend the Gathering due to the birth of my twins, but this year I was ‘allowed’ to go, though only from Friday to Monday…so I had to make the most of it! I flew into London, Ontario so that Sen and I could drive down to Niagara Falls together. We got there late afternoon and we realized that it was the first time we’ve ever been there on the first Friday as it was fairly quiet. With no publishers in sight, we got to have fun and just play games! We played Deception from Grey Fox Games with Jon Gilmour and a growing group of participants as we played it 4 times in a row. It’s a really fun game that mixes Mysterium with Werewolf. I got to play Azul from Next Move Games with Eric Lang, which was great as I hadn’t had a chance to play this one yet! It’s fun and thinky and a dash of screw you in there. Then Rodney Smith showed up and we played The Mind a few times. This game is super interesting! It’s like The Game, but with no talking! Then we played Deja Vu – and it got crazy as we all fought for the various pieces. We’re not sure if the fighting aspect is in the rules, but I’m sure that’s how I’ll want to play it from now on! I managed to crush everyone as I’m pretty good at speed games. We started our Saturday off with a pitch to Maple Games. We were pitching a game that we recently got back from a publisher that allowed their time to elapse. It’s a 1 vs. many, hidden movement game and it was fun to play this game again. Daryl from Maple Games wants to sign this one asap! He was already familiar with the game because he actually worked at IDW Games as a developer when we first submitted this game, and even back then he was a champion for our game. Then I saw Peter and Phillip from Eggertspiele and they were free so I showed them In The Hall of the Mountain King designed by Graeme Jahns and myself. They both really enjoyed it and thought it might be a bit too easy for an Eggertspiele game and a bit too hard for a Plan B game, but they liked it enough to seek out Sophie and Martin from Plan B to play it right then. We played it again and it was confirmed that it was indeed to complicated for a Plan B game, so then Sophie left it with Peter to determine if it was good enough for Eggertspiele. Since we had the attention of Martin from Pretzel, Sen and I showed him all of our expansion cities for Junk Art. It’s always interesting playing and pitching to Martin as he has an amazing brain that can find the most fun and most unique aspects to any game. He liked most of our cities and gave us direction on how to proceed. By now it was time for our annual tradition where a bunch of us head out to have some yummy wings at Duffs, and then we go to a movie! Usually we try to see a horror movie and this year A Quiet Place just opened, so it was perfect timing. We all seemed to really enjoy the movie even if we had qualms with some of the world building. 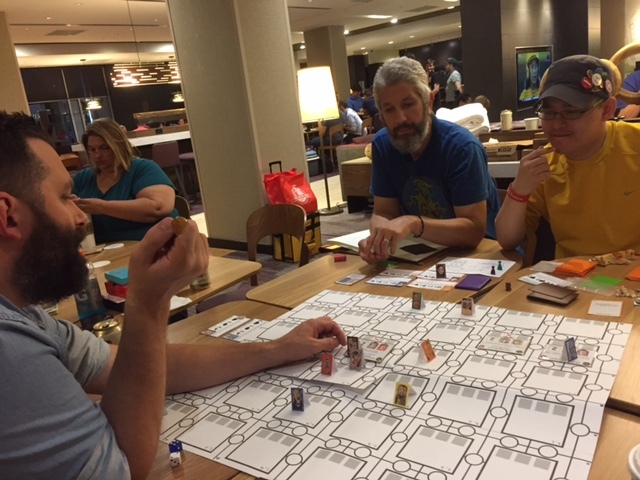 When we got back to the hotel, we played more games, like another round of The Mind and then we got to try the prototype of Roll Through the Ages: Medieval Age. This game had tons of pieces that snapped into a grid as you built out your city and we all really enjoyed it! I’m not allowed to show any pics of that one yet though. Then Sen and I fooled around with an alpha prototype of a game based on the comic Mind MGMT and while there were some interesting elements, there wasn’t enough there yet to know what to do next. Bah! Sunday, or as we might end up calling it from now on – Zevday, was jam packed full of Zev-y goodness. Before getting into our day of Zev, I was able to re-pitch FANimals to Helaina from Kid’s Table Board Games. I had pitched this to her at GenCon last year, received some feedback and changed the core mechanics because of it. She really seemed to like the changes and asked to keep he copy and for me to send a copy of the new cards. Done and done! Then we started our Zevday with our Godzilla game. This is a game we had signed with Toy Vault, who had the license to Godzilla through Toho at the time. Unfortunately Warner Brothers came in and purchased Toho and that made getting the rights a lot more complicated for some reason. So Toy Vault was fine with us pitching the game to another publisher, and knowing that Wizkids has a lot of experience with licenses and also that Zev is a huge Godzilla fan, we all knew this was an important pitch! The pitch couldn’t have went better as I played this 1 vs. 1 card game against Zev and was about to decimate him, when he pulled out some surprises and came away with the win! He really loved the game and said he’d do it if he can get the license! Huzzah! Then we showed him our hidden movement game to Zev and he really liked that one as well. 2 for 2! We all went for lunch and then afterwards I showed him a game designed by Don Kirkby and myself called War of the Words. It’s a game about trying to communicate with aliens via all sorts of mini word games. He really liked this one too! He said he’d like to test it with more people but really wants to do it! Wow – 3 for 3! We finished up by pitching In the Hall of the Mountain King and this was the only one that didn’t fit with him or the Wizkids brand. OK, 3 for 4 is not too shabby! We then finished our Zevday by playing Tichu with him and Stefan Brunelle but are sad to report that we couldn’t repeat our victory from last year! It’s the cards I tells ya – the cards!! I then found Nathan McNair and Jon Gilmour to show them Skirmishes, a game I designed with Shad Miller. I was excited about this pitch because this game seemed like a good match for this publisher. JF Gagne from Panda joined in as my wing man and we played a 4 player game. The biggest challenge to this pitch was that we were within the last few days for the Dinosaur Island Kickstarter so both Jon and Nathan were preoccupied throughout the pitch. That didn’t seem to matter too much because Nathan showered quite a bit of praise on the game. Sometimes you can never tell if a publisher really likes a game you’re showing them or not, but when they continue to find new things to praise about the game, then I feel pretty confident that they liked it! They took the game back with them to test further! I started the day with Sen as we fooled around with our new alpha prototype game that’s set in the Junk Art family and is all about dropping frames in order to score points. It’s still early in development but when Martin from Pretzel saw it, he got very excited and wants to make it his 2020 Pretzel game! Nice! Then I had a pitch session with Huch! as I wanted to show them FANimals and we played through it twice as we tweaked a rule that made the second game a lot more interesting. It was fun to play with them as well as William Attia (who has a revised Caylus coming out soon!). Then I showed them In the Hall of the Mountain King and we had quite the epic game! Ben really loved it and Britta said she wanted to play it again – which Ben says is always a good sign! Since it was the last day for me at the Gathering, I gave my copy to Huch to take back as Eggertspiele said they really liked it but are going to pass. All of the publishers were interested in our next step with the game – which was to make one central mountain that all players play onto, instead of each player having their own mountain. Next up was my pitch to Eric Lang from CMON. I showed Skirmishes to him as it seemed to be the kind of game they make. Eric spent a bit of time to explain the new direction that he wants to take CMON and this game no longer fits within what they’re looking for. He liked In the Hall of the Mountain King a bit more but still not a perfect fit. Sometimes rejection can be ok when you get knowledge of the kind of games a publisher wants instead. We were able to flag down Scott from Renegade and quickly showed him our sales sheets for our games as he didn’t have tons of time. We were able to chat about a game he signed of ours awhile ago and what the future of it will be…which is still uncertain, unfortunately. Our last pitch was with Tony from USAopoly. While we didn’t have a lot of time, he did express interest in trying some of our games later. He also let us know about a project he’s working on and asked if we’d be interested in bidding on it. Once we knew more about it – we jumped at the chance! We’re very excited about it (and can’t say any more yet)! And that was all the time I had at the Gathering this year. Sen and I drove back to London late that night so that I could get up 3 hours later and get to the London airport for a 6am flight back to Vancouver. Oddly enough, that didn’t stop the action on my game at the Gathering! Fabio from CSE Games was there midweek and brought the game Sigils that was designed by Shad Miller and myself to show around. This game was signed last year but he still likes getting it out to show it around and generate interest. Throughout the time that I was there, I had talked up In the Hall of the Mountain King to Helaina a bunch and she wanted to try it, but we couldn’t get our paths to cross again. Fortunately Sen was returning the following weekend and he coaxed the prototype away from Britta and Ben in order to show it to Helaina. They played it and everyone seemed to really enjoy it! She now wants a copy for herself too! Sweet! So that’s about it. My short, but whirlwind adventure at the Gathering this year. I didn’t get to play many other games or prototypes – though I did get to see the new 7 Wonders expansion: Armada being played and understand how it works. Looks really cool as this expansion tries to make you care about players other than your direct neighbours. It’s a lot of work leading up to the Gathering, so I’d like to thank all the playtesters that helped get our games to where they needed to be, and now it’s a lot of work after the Gathering, working on feedback we received! First review of Junk Art – Plastic Version! You can read the entire review here! With the birth of my twin sons not seven months ago, the chances of attending GenCon this year seemed rather dismal. Fortunately Best Buy Canada, my day job employer for the last 20 years, found itself in a need to attend. When they learned of the existence of GenCon they knew it was a great opportunity to meet publishers face to face in order to get them aligned with the upcoming launch of board games on bestbuy.ca. Having no contacts in the board game world aside from the distributors they deal with, they remembered a fellow employee who might know a thing or three about the board game world. Enter Jay Cormier! I was asked to not only set up meetings with the Best Buy buyer and key publishers, but also attend with him to make the introductions. So this is how Jay Cormier got to attend GenCon for free! 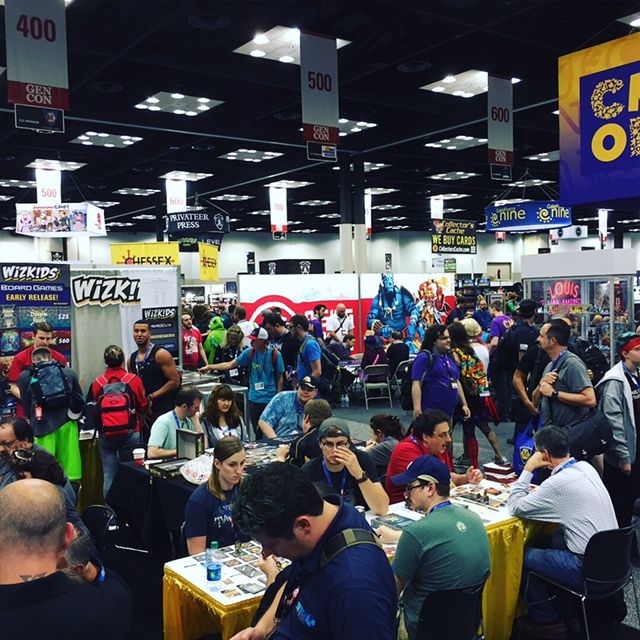 We spent the greater part of the first day of GenCon with Asmodee. We were given grand tours of all things Asmodee, including Fantasy Flight, Z-Man, Plaid Hat and Space Cowboys. We got to play a couple games – like Numbr 9 and Century: Spice Road – both great gateway games. We were also given some free time to wander the hall. I took this opportunity to introduce the Best Buyer buyer (let’s call him Kevin, because that’s his name) to several publishers that I didn’t have a meeting scheduled. We got to meet with Gamelyn Games, Green Couch Games, Kids Table Board Games, Perplext, TMG, Grey Fox Games and more. These meetings were impromptu and each publisher seemed happy to talk to a mass merchant with amazing online presence and 136 stores across Canada. Thursday night we went to dinner with Asmodee and got to relax and also understand more about the inner workings of Asmodee. Later on that evening I met up with Sen and others as we got to catch up! After that it was back with Best Buy and meetings set up every 30 minutes. We met with CMON, Renegade, USAopoly, R&R Games, Stronghold, Upperdeck, iEllo and Breaking Games. In between those meetings I was still able to introduce Kevin to even more publishers. The publishers all seemed grateful to have the opportunity to talk to Best Buy and Kevin was more than pleased to have met so many publishers and learn about their biggest games firsthand. Once Kevin left at around 4, then it was Jay’s turn to shine! I had an impromptu meeting with Foxtrot and showed them my new Fanimals game and they seemed really interested in it! After that Sen and I had a meeting with Oni Press. They are looking to make more board games based off of their comics (they started with Scott Pilgrim which was released – and immediately sold out – by Renegade Games). They were telling some of the favouritest game designers of all time about this to see if these so-called (and, more than likely, self-titled) amazing game designers could make some games for them. So they won’t be the publisher but they want to be the conduit between the creator and the designer and the publisher. Seems cool and my brain is already spinning! Next up was a meeting with Big Kid Games. He’s a new publisher but we really like the guy and we showed him our SimpliCITY game via email a few months ago. He expressed interest in it but wanted to play it through with us and then discuss possibilities. The game went great and he ended up realizing how much depth the game had once he finished a full game. His main challenge with the game was the marketability of a city building game. While that trope does seem like it has a constant place in a gamer’s collection (a city building game), it just didn’t click. So we brainstormed and thought that it could easily take place on a fantastical planet instead of boring old earth. We could also change the title to Complex City…which is funny since that’s the exact opposite of what it was before but we all like it and it feels like it fits better with a fantastical world. By the end he agreed that he wanted to make this game! Huzzah! Expect a Kickstarter in Q1 2019. Expect it! After a quick bite with some friends, then it was time to meet up with my favourite comic book creator, Matt Kindt! We have been talking for awhile about making a game based on his comic, Mind MGMT, and we had a rough alpha prototype ready to show him. We played it for about an hour and then brainstormed for another couple hours on how to improve it and where it should go from there. Super productive and super amazing to be involved in this project! We finished the night playtesting a game designed by indie comic creator, Chris Schweitzer! It was a racing game around a track with some neat twists. It was also an alpha so we provided some ideas to help him out. All day Friday I had to carry around my satchel and my luggage (only carry-on, thankfully) because my Best Buy free train was over so I had to check out of the hotel I was at and then meet up with my friend and co-designer on some other games, Shad, as he had an Airbnb I could stay at on Friday night. Whew! Got in bed by 1:30am. Saturday morning, up at 7 and out the door for a breakfast meeting with Zev from Wizkids. We showed him our progress on the Rock Paper Wizard expansion and he seemed pleased with the direction and progress (well I think he would have been more pleased if it was 100% ready though!). From there it was off to see Repos at 10. I had pitched Skirmishes to them back when I visited them in their Belgium office in October and so much had changed that I wanted to show him what was new. He seemed to like the streamlined changes but still expressed interest to make it 4 player as well, so that’s something we’ll need to work on. I was also able to show him Fanimals and Mystery of Mister E. He really liked both of them and wants to check them out further. He passed on our word game, Word Bird (though we thought of a better title for it yesterday – A Word in the Hand!) since it’s so language dependent. That said I explained a game I’m working on with a different designer, Don, that’s a dungeon crawler that uses word games to move around and battle monsters! He said it’s so different that he’d like to see it at least! While I was there he introduced me to the worldwide Asmodee game submission person who happened to be in the back booth we were in. I thought we were just going to say hi but he had time to see a game, so we showed him Fanimals and he loved it! He basically said that he wants it assuming his sales people think they can sell it. I’ve been tasked with making a short iPhone video explaining the game that he can use to pitch it to them. That would be huge! At 11 Sen, Jessey, Scott and I had a meeting with JC from Foxmind. We couldn’t find a table anywhere so we literally sat on the ground and started pitching games! I showed him Fanimals and Mystery of Mister E and he seemed to really like both of them! 11:45 and I was off to show Helaina from KTBG my two family games. While she was intrigued by Mystery of Mister E, she didn’t think it fit her brand, but seemed more excited about Fanimals. She introduced me to Marc from Big Game?? As she thought he’d really like Mystery of Mister E! 12 and I had to be at the Pretzel booth, but halfway there and something felt off…uh oh – I did not have my carry on bag with me!! Yikes! I ran back to the floor space where I pitched games to Helaina and whew, there it was! At Pretzel it was time to discuss the new cities we designed for Junk Art. Sen and I ran through them all and he liked 6 out of 7. What was great was that he was not only open to the idea of including a punch board of new items, but it seemed to be his solution to everything! This was great as we didn’t know if we had the ability to add other components. It’s great because 4 of the cities actual would work better with another resource instead of confusing things with repurposing fans. After that we brainstormed a few more ideas and that really got our engines revving! Finally we pitched him a concept for a new game in the Junk Art line. This was a concept we haven’t even tested yet because we literally picked up a package of laser cut pieces the day before from an online friend who was also attending GenCon! Good news – he loved the idea! Lots to work with too! It’s a pretty unique idea with lots of room for different ‘city’ variants. At 1 I met up with Shad again at the Mayday booth to re-pitch Skirmishes. We had pitched it to them at Essen but they hadn’t acted on it since then, and when I communicated to them earlier I told them that so much had changed since then. The pitch went really well as they really like the game. The biggest challenge for them is whether they want to do a 2 player combat game or not! They are starting to grow their brand into more strategic games…so maybe. They took the prototype! My last meeting was with Ed from Toy Vault where we talked about the future of our Godzilla game. We have a contract for it, and we got the rights a couple years ago from TOHO to use the license, but then TOHO was bought by Warner Brothers and since then we’ve been stuck in legal circles. We just don’t know if and when they’re going to provide the license. So we have a choice – remove the IP and make it a generic kaiju battle game, or talk to Zev at Wizkids to see if he has the license and if he’d be willing to publish it! We walked to his booth and gave him the story and he’s going to check when he gets back if he does have the license or not, or if he can get it! Then we’ll have to pitch him the actual game! After that it was time for Jay to leave to fly home and see his lovely but inevitably tired wife and super cute twins. But wait, there’s more (plug!)! I had emailed Fabio from CSE prior to coming about a game he was assessing, designed by Shad and I called Rack Your Brain. He’s had the game since last GenCon, but we really wanted the game with him as he could brand it as part of his Quartex family of games. In the email I asked if he wasn’t interested if he could bring the prototype back at GenCon. Well, I didn’t get a response to that email and Sen knew I was looking for his booth but couldn’t find it, but he did find Fabio. He told Fabio about the email I sent and Fabio checked his Junk folder and lo and behold, Jay Cormier’s email. Fabio emailed Shad and I on Saturday trying to find a time to meet up but I could t make it work since my schedule was packed and I had to leave at 2:30. So Shad volunteered to meet up with him and grab the prototype. I find myself on the plane and we’re just sitting on the Tarmac and I get a call from Shad and he said that Fabio didn’t want to give the prototype back…he wanted to sign the game! Woo hoo! They played it together and had a couple tweaks they’d like to make and indicated that it would be a 2019 release, but they like it! Yay! What a great way to end the con! So 2 games signed, 1 game with serious interest from multiple publishers, including really serious interest from a big publisher, a 2 games with decent interest! 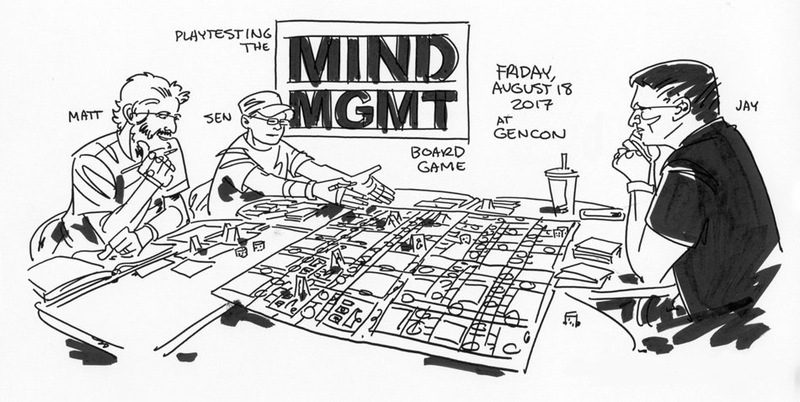 Plus discussions on Rock Paper Wizard expansion, Junk Art expansion , Junk Art new game idea, Powers game and the playtest of the Mind MGMT game…plus all the work I did with introducing Best Buy Canada to all these publishers … I’d say that was a pretty successful GenCon! Junk Art nominated for 2 Golden Geek Awards! J unk Art, designed by Jay Cormier and Sen-Foong Lim and published by Pretzel Games has been nominated as the Best Family Game and the Best Party Game for a Golden Geek award on the popular Boardgamegeek website. The award is more of a people’s choice award as people are encouraged to go to their site and vote on the games that they like best. To vote for Junk Art and many other games, in many other categories, check out their site! You will need a login to their site, but that’s easy to get and free! Vote for your favourite games and check back after the polling closes on March 6th!